Tuesday, June 1, 2010 - Muqata Reporting from Israel. This post will be on top all day as we follow the Flotilla Terrorists and the IDF response. Refresh your browser and visit us often for updates around the clock. 9:10 PM Channel 1 reporting. 50 flotilla terrorists turn out to be suspected Al Qaeda mercenaries. Over $1 million dollars in cash found on the boat. 8:46 PM Israel TV reports that some of the flotilla terrorists were equipped with night vision equipment and ceramic vests. 8:24 PM Newly released IDF Spokesman Video/Audio (like 5 minutes ago!) of soldiers being attacked when they boarded Flotilla ships. 8:13 PM The MV Rachel Corrie is on its way to Gaza from Malta....how appropriate. 5:31 PM Did the Israeli Defense Forces Commandos Commit “Piracy”? Nope. 5:21 PM Own a boat, yacht, jetski or you can row pretty well? 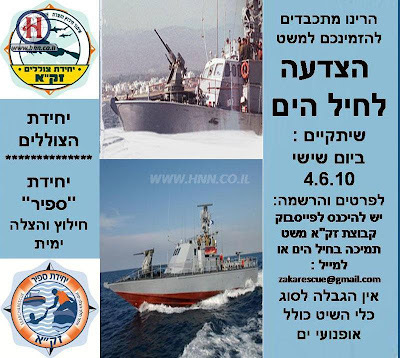 The pro-Israel flotilla project is underway -- this coming Friday is the salute to IDF, pro-Israel flotilla. More details on their facebook page. 4:54 PM Who's Who on the Flotilla Passenger List? Israeli officials said that about 50 of the 671 activists have been taken to Israel’s international airport for deportation. They say others have refused to identify themselves and will remain in detention. Henning Mankell, 62, Swedish author of the Inspector Wallander books. He was on board with eight other Swedes and had still not been contacted last night. Mankell is married to the daughter of the film maker Ingmar Bergman. Anders Joerle, the Swedish Foreign Ministry spokesman, said that they were not all being held at the same place and some had been imprisoned while others had simply been taken into custody. “I think Henning Mankell is just being held in custody. I’m not sure. The Israelis have him in some kind of detention,” he said. Some of the Swedes had been very slightly injured, Mr Joerle said. They have reportedly been given the choice between accepting deportation or to be tried in an Israeli court. Edward Peck, 81, a former US Ambassador to Mauritania, was expected to arrive home today after the Free Palestine movement ship that he was on was seized by Israeli commandos. Ann Peck, his wife, said that she received a brief e-mail from the Israeli Foreign Ministry yewsterday informing her that her husband was fine and on his way home. The e-mail said he was likely to arrive today, but that did not have a mobile phone with him and would call from an unnamed New York airport when he landed, she said. “He gets himself into these messes, and the phone is going to ring,” she joked. Mrs Peck said that as of yesterday evening she had not spoken to US officials, nor had she been able to talk to her husband, since the raid. She had last spoke with him briefly by satellite phone just as the aid ships were leaving their rendezvous point. Mr Pek served as deputy director in President Reagan’s White House Task Force on Terrorism. Joe Meadors, 63, of Texas, is a navy veteran. His wife Jean said yesterday evening that she believed he was safe, “but I’d like to hear that from him”. She said his exact status, whether under arrest, detention or otherwise, was unclear. Mr Meadors served aboard the US Navy intelligence ship USS Liberty that was attacked by Israeli forces in 1967, killing 34 crew members. “He hasn’t had much luck with the Israelis,” his wife said. David Schermerhorn, retired television commercial producer of Washington state, was also on the flotilla as an activist with the Cyprus-based Free Gaza Movement, his daughter told The Seattle Times. Kate Schermerhorn said US Embassy officials had told her that the 80-year-old was taken into custody by Israeli officials and was unharmed. Three German MPs and a Swedish MP were among those heading to Gaza with aid. Peter Venner, 63, a father of two from the Isle of Wight. He runs a wood yard and became involved in delivering aid to the Palestinians three years ago and last January drove a truck full of humanitarian supplies overland to Gaza. This was his first journey by sea. His partner Rachel Bridgeland, 51, told the Daily Mail: “Peter is definitely not a violent man — in fact he is exactly the opposite. The last time I heard from him was Saturday. He was in high spirits. He told me he knew the Israelis would try and stop them. But no one knew it was going to be like this. Denis Healey, 55, from Portsmouth, was the skipper of the Challenger 1 boat that carried 20 passengers including three German MPs, a Swedish MP and a former US colonel. He has a longstanding involvement in the Palestinian movement and has captained boats on previous aid journeys into Gaza, including one two years ago in which the boat was rammed by an Israeli gunboat. He is a marine engineer and now lives in the Cypriot port of Limassol with his British partner, Ruth Baker. Paveen Yaqub, 39, from Huddersfield is a council worker and was on board Mavi Marmara, the lead boat in the flotilla. Some of these people are simply foolish, eccentric, useful idiots who ended up on a boat ride they mistakenly assumed was a cruise trip of the Mediterranean. See the whole list here at the UK TIMES ON LINE. "They wielded clubs, axes and knives," he said. "I was the second to go down the cable, one of the guys from my group was already down there, and there were a few people on him. At first it was one-on-one, until more soldiers came down." Regarding the troops' preparation for a more extreme scenario on the decks, R said they had prepared for both passive and violent resistance, but admitted he had been surprised by the strength of the resistance. "We knew they were peace activists," he said. "Though they wanted to break the Gaza blockade, we thought we'd encounter passive resistance, perhaps verbal resistance – we didn't expect this. Everyone wanted to kill us. We encountered terrorists who wanted to kill us and we did everything we could to prevent unnecessary injury." R said that some 75% of the people in the vessel resisted violently, "each one with a knife in his hand." 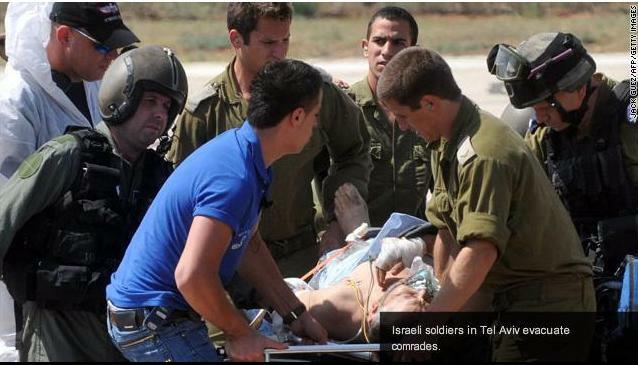 R. was the soldier who was thrown from the deck, as shown in the footage distributed by the IDF. "I was in front of a number of people with knives and clubs. I cocked my weapon when I saw that one was coming towards me with a knife drawn and I fired once. Then another 20 people came at me from all directions and threw me down to the deck below." "Then I felt a stabbing in my stomach. It was a knife. I got the knife out, then somehow got down to the lower deck where there were more people. This was when the soldiers had got control of all the boat except the lower deck. Me and another soldier managed to get to the deck, and we jumped into the water, from where our forces collected us. Another soldier who was beaten hard lost consciousness. Other soldiers covered him until we managed to get him out." Read it all here. 4:38 PM Minutes ago, it appears an IDF missile hit near "Beit Lehiya" in the Northern Gaza Strip, targetting a Palestinian Qassam rocket crew who were preparing to fire on Israel. Palestinian sources report many killed, but as of now, none have been confirmed. 4:03 PM Video; Palestinians arrive in Jerusalem's Meah Shearim neighborhood for a demonstration. 2:45 PM 2 rockets land in open areas near Ashkelon. No injuries or damage reported. 2:41 PM "Color red" rocket warning system blaring in Zikim (North of Gaza Strip). 2:29 PM Arabs in the Shimon HaTzadik (Sheikh Jarrakh) neighborhood in Eastern Jerusalem -- opposite Jewish homes, display Turkish flags in solidarity with the Flotilla terrorists. 1:27 PM Professor Richard Landes: When an army that is vastly superior, but neither wants to be killed nor kill, meets an vastly inferior enemy who wants to kill and be killed, it behooves both participants and observers to understand why things go awry. 1:17 PM IDF soldier -- victim of brutal "peace activist" terror. 12:56 PM IDF Spokesman Blog posts new photos of weapons found aboard flotilla ships. 12:51 PM This morning, the IDF had to "face the music" at a meeting with a Knesset Defense subcommittee. Two main points: The IDF is prepared for 2 more ships which are on their way from Turkey and should be arriving in our area within the next 48 hours. 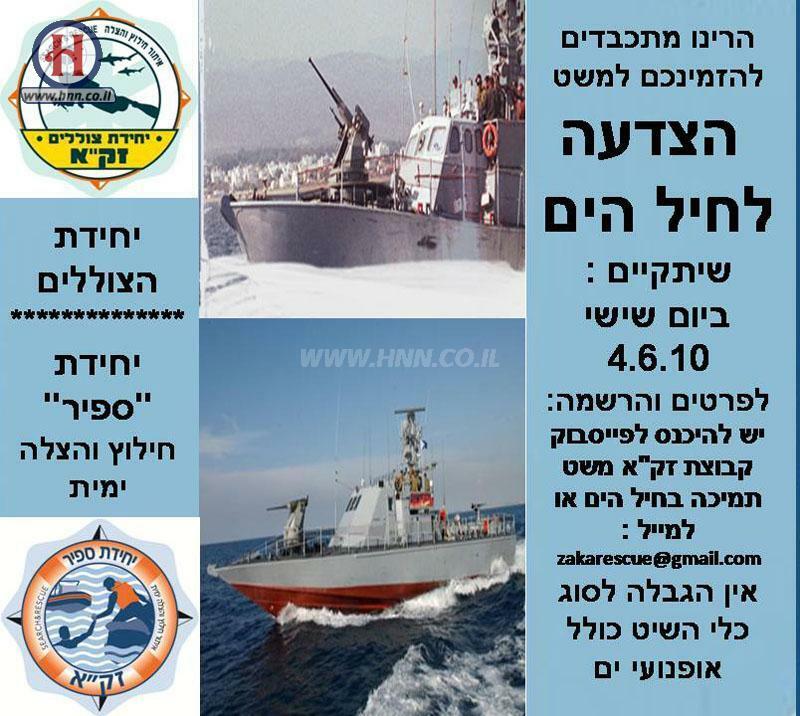 Secondly, YNET reports; "Head of the General Staff's Operations Division Colonel Itzik Turgeman told a Knesset committee that the option of taking over the aid ship en route to Gaza was chosen after other options were ruled out, including the possibility of stopping the flotilla via other means. He said it was impossible to stop the Marmara ship due to its size, strength and speed. He said the option of disabling its motors was ruled out because the time required to haul the ship to the shore would have been too long. He added that the two firearms found on the deck of the ship did not have bullets in them, since they had been fired. (Ronen Medzini)"
Bar Ilan University pedestrian bridge over highway 4. Eilat: Next to shopping center. If you can take photos of these, or any any pro-Israel demonstrations around the world -- please send them here for publication! 10:47 AM Released for Video testimony from IDF soldier, subtitled in English. 10:18 AM Refuah Shleimah to all our brave soldiers injured yesterday. 10:14 AM The IDF has video information in realtime. They could have released (or authorized the release) and showed the Flotilla terrorists' violence hours earlier when it would have been even more effective. Why the delay? Speed it up guys! 9:57 AM The 2 Gaza terrorists were killed. 9:38 AM 2 Peace Loving terrorists from Gaza are involved in a firefight with IDF troops at this time. Earlier, Residents of four communities in the Eshkol region were instructed to remain indoors, due to a possible terrorist infiltration. Some of the roads in the area were also closed to traffic. 9:35 AM Israel Reshet Bet Radio reports this morning that a new Flotilla Terror Convoy is due to arrive at Israel in the next 24-48 hours from Turkey. 8:56 AM Photos from last night's pro-Israel demonstration outside the Turkish embassy in Tel Aviv. 8:00 AM Good morning and welcome back. We have a lot of flotilla related photo, videos, and more which we plan to release on the blog today as soon as we get authorization and permission. A reminder to all you pro-Israel twitterers. Make sure you include #Flotilla, #FreedomFlotilla and #Gaza in your tweets. It's driving the Flotilla terrorists nuts that links to photos and videos they don't want anyone to see or know about are coming up on top of twitter searches. We've gotten some very nasty feedback telling us its working well. Kol Hakavod to everyone. At some point in the week (if we're not too busy) we hope to post our analysis of the successful operation to stop the Flotilla. We've noticed from other comments/posts on the internet that some people (Leftists particularly) see the world in black and white and really don't understand the complexity and background of what happened yesterday politically and militarily. They simply, in their knee-jerk fashion, believe Israel was either wrong or acted incorrectly. We have no hope for them. This analysis will be for everyone else. 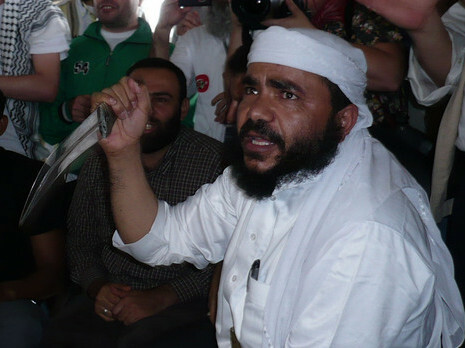 And don't forget to repost the picture of the Flotilla's unarmed, peaceful humanitarian aid worker. A picture really is worth a 1000 words. It takes just 1 Click to help Israel! Israel really has to take advantage of this tragedy. They must use it, and the documentation that they have to forcefully demonstrate that not only were these people not "peace activists" but that the knee-jerk, as usual reaction by the press, as well as by leaders of foreign states is simply wrong. They can't be content with disproving allegations regarding the flotilla. They should use this to change the entire way the world views Israeli operations in general. The world doesn't understand that Israel only wanted to check the contents on the boats. But then people started attacking the soldeirs and so the soldiers had to defend themselves. B"H There are healthy Jews displaying a healthy reaction. Enjoy the protests. I will try to take a picture if I can go. I know you are being sarcastic (used the software) when you say "moderate" Jewish bloggers, but that's like a "moderate" member of Hizbollah. It's not their fault they will believe anything that a fellow "moderate" will say (even long after the fact) as long as its critical of Israel. It's an illness. Good morning, Jameel and Joe, and all of you in Israel. Thanks for all your work, I'll keep your blog open all day. Anti-Semites ALL need to be killed. Any Jew who doesn't get it will end up being fish food someday. If the IDF brass are not going to fight a war Israel obviously needs to fight, its time to replace them with people who will fight for victory, not to handle vicious Jew killers with kid gloves. In the face of such belligerence boats like this need to be torpedoed! Grasshoppers, spread the word! Jenny, get your head out of the sand. Killing your enemy is not a "tragedy." Its a legitimate act of self defense. Nothing happened yesterday for which Israel needs to issue an apology. 1. You're a disgusting person. What the heck are you talking about? Where did Jenny say that "Israel needs to issue an apology"?? I need some information about the 600 people who have entered Israel...other than the fact that you can say they were "forced" to enter Israel..did they have passports/documentation and will any be allowed to go on to Gaza? NormanF: Jenny's on "our" side. There's no reason to get nasty. Safranit: Apparently, many threw their passports overboard. You mean as opposed to the "side" of these peace activists, who side with a terrorist organization, well known for its desire to throw the Jews into the sea? I am on the side of true peace and justice. I probably don't see eye-to-eye with Jameel on everything he says (I voted Bayit in the last election), but I really don't see how there's an issue here. 2. in enforcing that blockade, Israeli troops were attacked, and fired only when their own lives were clearly in danger. The incident should be used to expose the terrorist sympathizer's falsehoods - from the purpose of their mission to their claims regarding what transpired on the ships. However Norman, you cross all lines. Your rhetoric is no different from theirs, and I fail to see how, if these truly represent your beliefs, you can claim any sort of moral high ground. Jenny; You mean as opposed to the "side" of these peace activists, who side with a terrorist organization, well known for its desire to throw the Jews into the sea? And they should be allowed to kill Jews first? I don't think so. And I don't think its a tragedy when Jew haters are killed. We're not talking about decent people here - we're talking about terrorist thugs who tried to beat Israeli soldiers to death. And I'm a disgusting person for not wanting that to happen. When people side with a group with the genocidal philosophy Hamas has, yes, extreme measures against them are justified. When you support Israel's destruction and take part in the war against it, you should pay the price. Palestinians arrive in Jerusalem's Meah Shearim neighborhood for a demonstration. These guys ought to apply for funding from the NIF and the EU, if they're not already getting it. It is not crossing all the lines to oppose evil. Hamas is evil and any one who supports them in my book, is evil, too. None of what I said means harming any truly innocent or righteous person is ever right. I have never said that. But people who do evil as the Bible says, come to no good end. So I can claim the moral high ground. We must make sure evil people don't ever get to harm the righteous. My position is the exact opposite of Hamas, which wants to kill every Jewish man, woman and child in the world -opposing them (and those who would help them) is opposing who the Nazis used be that is exactly what they are today. Lurker, its nice to see the Palestinians have a friend in Turkey who supports their fascist desire to wipe out Israel. I don't peace happening with them in our lifetime. I may have misunderstood Jenny and if so, I apologize. I happen to think what happened yesterday is no tragedy at all. That is what the rest of the world thinks. I offer her my apology if she meant it in a different sense. Those who seek who murder Jews deserved what happened to them. NormanF: And they should be allowed to kill Jews first? I don't think so. Um, hello? What are you talking about? Who said that "they should be allowed to kill Jews first"?! Certainly not Jenny, or Jameel. You appear to be responding to statements that exist nowhere but inside your own head. I am talking out loud about how the rest of the world sees it, not Jameel or Jenny. Otherwise, it would be appreciating what Israel is doing to clear the Mediterranean of the Barbary Pirates of our day. And this is not inside my head. These people who were killed, tried to murder Jews. And this is for whom the world is mourning today. That video from Meah Shearim made me feel a bit ill. And we are supporting them with our tax dollars, yes? Gila: That video from Meah Shearim made me feel a bit ill. And we are supporting them with our tax dollars, yes? Based on the slogans on their signs, they appear to be Neturei Karta. If so, then the answer to your question is no, since NK refuses on priciple to take any money from the Israeli government. They have taken money from the Iranian government and the PA, however. They are entitled to be fools. Israel is a free society. That said, if Hamas is ever defeated, I do think there is a chance for real peace to happen. As long as it exists, no Palestinian Arab will dare to seek a compromise peace with Israel. Jews in Israel would be more than happy to live in peace with people who accept their existence and who see them as human beings with full rights. They just have a zero tolerance policy towards Hamas and their fellow travelers in the West. Moreover, if you weren't in such an incredible rush to kill people you don't like, you might think for a second that the needless injury to more than 10 Israeli soldiers can be considered a tragedy, even before you deal with anything else. The country of Britain: has condemned Israel's actions - as "barbaric." Together with the UN and other European countries. It was Britain: that went out of its way to sink the ships of escaping refugees from WW2. That is how barbaric and evil the British are. And it was Churchill – who refused all the pleas of Menachem Begin, the Head of the Irgun - to stop the barbaric killing of the refugees on all the boats which the British sank. Churchill could have prevented the murder of millions of Jews by Hitler. Instead, he waited for the Germans to quietly "finish the job." And Churchill himself, was evil enough to order the sinking of the refugee ships of those who had escaped the Germans. Shall we all subject Britain to international isolation and condemnation? How about an investigation into Britain’s wartime crimes? Or shall we have international sanctions against Britain? "The rule set for Israel, which applies to no other nation in the world, is an intentionally impossible one to meet: the Jewish state can only defend itself without harming terrorists, who abide by no laws of war and exercise no concern for Israeli casualties. Words are twisted: Israel is transformed into ”the aggressor” in each instance, and the “peace” forces — in this case, populated by Turkish IHH forces with ties to Hamas and other terror groups — are those that attacks Israelis." She is exactly right. The truth is reversed. Israel did not seek bloodshed but when its hand was forced, it had to defend itself. The question is - am I am sure Jameel will add to this, is whether Israel has any legitimate way of defending itself with legally sanctioned force under international law. The answer evidently here appears to be "no." And in the rush to condemn Israel, the world is making more, rather than less likely, another Middle East War. That I consider to be a real tragedy that well could happen in the wake of Monday's events. Information on another 7 of the foolish, eccentric boat passengers can be found here. You're confusing international law with the statements coming from the nations of the world, which have nothing to do with IL and everything to do with political expediency. Israel can (and does!) fight a moral, legal fight against those who will use every evil available to harm her. The fact that you think that Israel should abandon all rules doesn't surprise me after your comments today. Muqata write: "The IDF raid may well have violated international law governing disproportionate and excessive use of force against non-combatants" and then is fixated on the charge of piracy. He he/she kidding? Check out the video of the Israelis coming down the ropes like sheep to the slaughter and get back to me on 'disproportionate force'. Why isn't Israel demanding explanations from Sweden, Germany and any other country who had MPs (Ie, official representatives) on that boat? Lurker- just join Im Tirtzu already? What is it with the Satmar group, or with Neturei Karta? If Zionism is their beef, that's one thing, but these folks are supporting haters of Jews, who deny the holocaust! Do they believe if we hand over the country to this enemy, that teaches "kill Jews" to pre-schoolers, they'll live in peace with these monsters? Maybe a Satmar fellow can clue me in. I'm not looking to bash the Satmar folk, only to understand what it is they want. at the edge: What is it with the Satmar group, or with Neturei Karta? If Zionism is their beef, that's one thing, but these folks are supporting haters of Jews, who deny the holocaust! Don't confuse Satmar with Neturei Karta. They're both anti-Zionist, but Satmar does not associate in any way whatsoever with antisemites. Neturei Karta are the ones who befriended Arafat and served in his government, and who embraced Ahmadinejad and attended his Holocaust denial conference in Teheran. Satmar would never dream of doing any of those things. In fact, after the Holocaust denial conference, and on account of it, the Satmar rebbe (one of them, anyway) signed a herem against Neturei Karta. I was told a story once about a candidate for the New York State Assembly (non-Jewish), who met with the Satmar Rebbe to ask for his endorsement. After the candidate gave his pitch, the Rebbe asked him several questions. One of them was, "What is your position regarding the Arab-Israeli conflict?" The candidate was well aware that Satmar is very anti-Zionist, aand the question therefore made him uncomfortable. Neverthless, he answered, "To be honest, Rabbi, I have always been a very strong supporter of Israel". The Satmar Rebbe seemed pleased with this, and told the candidate that he would tell his hassidim to vote for him. The candidate was confused, and asked, "Rabbi, I had been under the impression that you were opposed to the State of Israel". The Rebbe replied, "That's an internal issue between me and my fellow Jews. It's completely irrelevant to you, and you need not concern yourself with it. What's relevant to me here is the fact that goyim who are anti-Israel are almost always antisemites." Jenny, what rules? When enemy comes to kill Jews, they should be killed first. And Israel needs to get its story out to the world first. The Turks and Hamas got their version out first and Israel lost the PR war. The first impression, right or wrong, always wins. Israel's hasbara machinery is in need of a serious overhaul. As Jameel will relate, Israel spends less money on public relations than the budget of one Israeli soft drink company. This needs to change - and fast. Jenny, international law is ignored when it comes to Israel. I want to Israel to behaving like a normal, self-respecting country. The rest of the world doesn't have scruples in dealing with murderous terrorists. Its time Israel followed their example. Which Western country should receive the deported terrorists? the US? France? England? 360 View of the Kotel. US State Department vs. The Settlers. Moonbat Lunatics boycott the wrong boat. New Videos, including, "I Want to Be a Martyr"
You call that Humanitarian Aid!? Hamas refuses to accept Flotilla Aid! How does it feel to be Israeli, today?